Many of the psalms have Superscriptions or Headers at their beginning before getting into the actual psalm itself. Most of these are technical or musical notations referring to types of instruments or tunes. Some refer to particular episodes in biblical history to which the psalm supposedly relates; the most famous of these being Psalm 50(51) A Psalm of David, when Nathan the prophet came unto him, after he had gone in to Bath-sheba which explains why David is so repentant in that song. Psalm 45 (confusingly numbered 44 in some Bibles) is unusual in that in addition to the technical part the superscription adds "a love song" or as one version beguilingly puts it A canticle for the Beloved. It is also unusual in that most Christians agree that its literal meaning is of secondary importance to its spiritual one. Naturally, Christians being what they, there is a bit of a falling out as to what that meaning actually is but we shall come to that by and by. On the face of it the psalmist seems to be primarily concerned with celebrating a Royal Wedding. Specifically the marriage in Jerusalem of one of the kings descended from David and Solomon to a foreign wife. Perhaps, indeed, that was all that the author consciously intended to do. There is though a constant motif that runs all the way through the Old Testament in which the relationship between the Almighty and His People Israel is compared to that between husband and wife. It was natural enough then in light of that to incorporate this psalm into that motif. Christianity took that theme up and saw in the bridegroom the figure of Christ and in the bride an image of the Church. And as in the larger so in the lesser it could also be seen as a portrayal of the relationship between the individual believer as lover and Jesus as the Beloved. A further, more controversial, layer of meaning will be referred to later. Forget i.e. turn away from. When she has done this and as a result of having done this she will become beautiful (or more beautiful) in the eyes of the King and, therefore, He will desire her. In the context of a Jewish wedding what follows from that will have been in the minds of those who first heard the psalm Wherefore a man shall leave father and mother, and shall cleave to his wife: and they shall be two in one flesh (Genesis2:24) Where the bride is a human and the groom is God incarnate then what we have here is a prescription for achieving Divine Union where the bride enters by participation into the very being of the Blessed Trinity. A prescription is only of use if it is possible to fulfil its requirements. So, can we, could the bride, do what the psalmist proposed? The first injunction is 'Listen.' We live in an age where people walk around the streets or sit on public transport listening to personal stereos or mobile phones. When not doing this they listen to TV's, radios, DVD's, movies and even, occasionally, each other. When not listening they are usually talking. People even sleep with TV's turned on. The problem you might think is not that there is too much listening but that there is too little silence. In fact, from a spiritual point of view, there is too little listening because there is too little silence. God speaks to us it is true but in a still small voice (1 Kings 19:12) To hear Him we must listen attentively for Him alone, be still, and know that I am God as another psalm puts it. (Psalm 46:10) To listen to Him requires an effort on our part, a desire to hear Him. Specifically there are several ways that Christian tradition recommends to us as methods through which we might hear the voice of the Bridegroom. Reading the Scriptures is one, or actually two at least since there is more than one way to read them. We can take a passage or a chapter or a book in the Bible, begin at the beginning and work our way right through to the end. Then we can think about what it means and, if we are wise, we can consult the opinion of others by reading commentaries on the text and see what better minds than ours have made of it. That is one method and the Gospels in particular are well suited to be used in this fashion. Another approach would be the practice known as lectio divina where after prayer we take a very short passage of Scripture read it slowly and/or repeatedly and then let it slowly sink into us. Not so much thinking analytically about it as holding it in our minds and waiting to see what fruits will spring from the seed within us. As I have already hinted there is the practice of prayer to help our listening too. In this context it cannot consist of a list of demands that we want God to action but rather of an upward motion of our heart inviting a downward motion of His Spirit into us. In my series about Christian Meditation I outline a number of ways to do this. God also acts at times through human agents. We can hear Him if we pay close attention to the lives of the Saints. The Christians of the Reformation traditions (often called Protestants) tend to restrict themselves to the examples given us by outstanding biblical characters, and indeed there is a rich treasury of such to be found within the pages of the Bible. Catholic and Orthodox Christians look additionally to the many examples of Christian living which the past two thousand years have given us. Throughout the world and throughout the ages Saints of widely varied characters in all sorts of settings have shone like good deeds in a naughty world (Merchant of Venice Act 5 Scene 1) Whatever our own personality type or circumstances might be we will be sure to find a Saint whose life, words or deeds will speak the voice of God to our own condition whether that be the wisdom of a St Therese, the gentle patience of a St Bernadette or the outspoken counsel and visionary insights of a St Catherine of Siena. Nor indeed need we confine ourselves to the past. It is well known in the West that the spiritual traditions of the East call for spiritual seekers to look for wisdom at the feet of gurus. What seems to be a well kept secret is that the West too has a long tradition of Spiritual Directors, male and female, who are steeped in the various contemplative and prayerful spiritualities of Christianity and have the wisdom and experience to guide others. So, we the Brides can, if we wish, listen to our Lord speaking to us through all these channels and others besides. Then what does the psalmist counsel? 'Consider.' This seems fairly straightforward. Reflect on what we have heard, consider it from various aspects, impact our options. Except that we are not considering a business transaction or a career change neither has our listening been of a conventional kind. With Jesus 'to listen' means 'to encounter.' He is our potential bridegroom, to have and to hold, in sickness and in health. It is not enough just to weigh up with our minds the pros and cons of His proposal to us, though we could certainly do that on the Pascal's Wager principal. We need to respond to Him with our whole selves, body, mind and spirit, because we will be living with Him with our whole selves both in time and in eternity if we accept His offer of marriage. If His call awakens something within us then we need to consider what it is we shall lose if we accept Him as well as what it is we shall have to gain. He may call upon us to sacrifice material things or established relationships upon which we have so far relied and depend instead entirely upon Him and upon Him alone. Having considered we must turn to Him decisively. We turned aside from our way to listen to Him. We paused to consider what we had heard. Now He becomes our way, He is the route we travel and the destination at which we arrive. He nourishes us, He sustains us, He loves us and unites Himself to us and we allow ourselves to be united. The foreign bride of the psalm is urged to forget her own people, meaning her nation, and her fathers house, meaning I suppose both her family and her national religion. At a literal level this is a sacrifice which Jesus later put in these terms Whoever comes to me and does not hate father and mother, wife and children, brothers and sisters, yes, and even life itself, cannot be my disciple (Luke 14:26) It is a radical gamble, to cast yourself into His arms and let everything else slip away from you. And indeed this forgetting of what lies behind is partly a conscious effort of casting aside all impediments. More than that though it is a becoming absorbed in new interests. Very often the close friends of a new bride expect their friendship to continues much as before, the bride herself may expect so too. But gradually as time passes, perhaps as children arrive, the things which concern her, which she cares about, which she is willing to sacrifice for become more and more different from those things which a single girl about town has on her mind. The forgetting then is less a casting of of the old and more a putting on of the new. There is a more than literal meaning though to this command to forget. God does not hate families or expect us to do so either. Except for those few people called to live out their Divine Matrimony in monasteries or hermitages most Christians will experience the companionship of the Bridegroom in the context of their own domestic setting, their earthly spouses, children, parents, siblings, friends, communities, Churches. There Jesus is to be an inseparable companion, His friendship and example enriching the way that we give of ourselves to those dear to us, the way that we love and are loved. The turning to Him, the forgetting of earthly chains becomes not a negation of these relationship but a raising up of them to a higher level, a spiritualisation of them. If the Saints have acted as agents of God to us then we must act as agents of God to our neighbours for if we are one flesh with Him how could we do otherwise? There is one important proviso in all that we do however, Every Christian must be a potential martyr. The commitment we have made is one that overrides all others. Given a choice between suffering or even death on the one hand or repudiating our faith, by word or deed, on the other then we must be willing to suffer and dies if needs be. Not because we desire a reward in heaven but because we are faithful spouses. At this point, given many events in recent world history, I feel the need to stress that for Christians the concept of martyrdom consists of a willingness to endure suffering but never, never, never a willingness to inflict it. The Bride who has done these things, listened, considered and turned towards the Bridegroom, becomes in His eyes beautiful precisely because she has done those things. In the whole history of humankind it sometimes happens, rarely I'm sure but sometimes, that a bride becomes a little vain. She is proud of her beauty and congratulates herself if only within herself about it. In his letter to the Ephesians St Paul lets us into a secret about the bride of Christ. 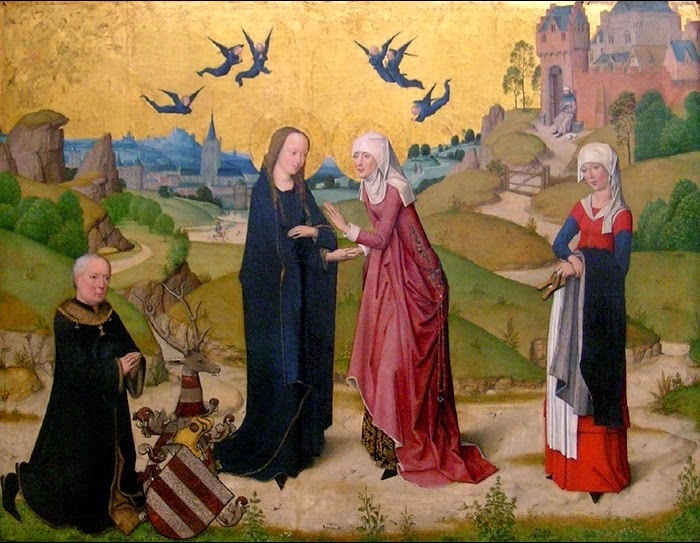 Husbands, love your wives, just as Christ loved the church and gave himself up for her, in order to make her holy by cleansing her with the washing of water by the word, so as to present the church to himself in splendour, without a spot or wrinkle or anything of the kind—yes, so that she may be holy and without blemish. (Ephesians 5:25-27) Any beauty we may have comes to us as pure gift from the Bridegroom. What Christians call Grace, the work of the Holy Spirit in our hearts, is the very thing that prompts us to listen, that helps us to consider wisely and which sustains that act of will by which we turn towards Him and keep turned towards Him. And it is the sacrifice of the Son on the Cross at Calvary that washes us clean from all the acts by which we have disfigured our beauty from the very moment that we first set our heart on anything other than Him. So if we are radiant brides He is our radiance, if we have a beautiful dress He has supplied it. Another motif which runs through the Old Testament is that of adultery, the sin by which Israel turns from the Almighty and runs after other husbands. If we too fall in that way then our Groom stands ready to make us anew if we once again turn back to Him. We have no cause for vanity or pride but many causes for gratefulness and, it maybe, for repentance too. Not the least cause for our gratitude lies in the fact that He, Creator of all that is seen and unseen, desires us. He loves us. He died for us. We are not instruments to be used we are made by Him in His image and likeness. Despite all that we have done to mar that image, to distort that likeness He will patiently help us to reconfigure ourselves to our Divinely crafted original. He desires us, if we remember this continually then we will as continually strive to make ourselves worthy of that love by allowing His hands to mould us into that which we should always have been had not our blindness and folly led us astray down dark paths where He is not to be found. And so to the controversy. What I have said so far is I think common ground among most Christian traditions. Catholics see in the figure of the bride all that Protestants see. In addition, however, they discern Mary the Mother of Jesus. In part this is because, in a sense, Mary is the Church. 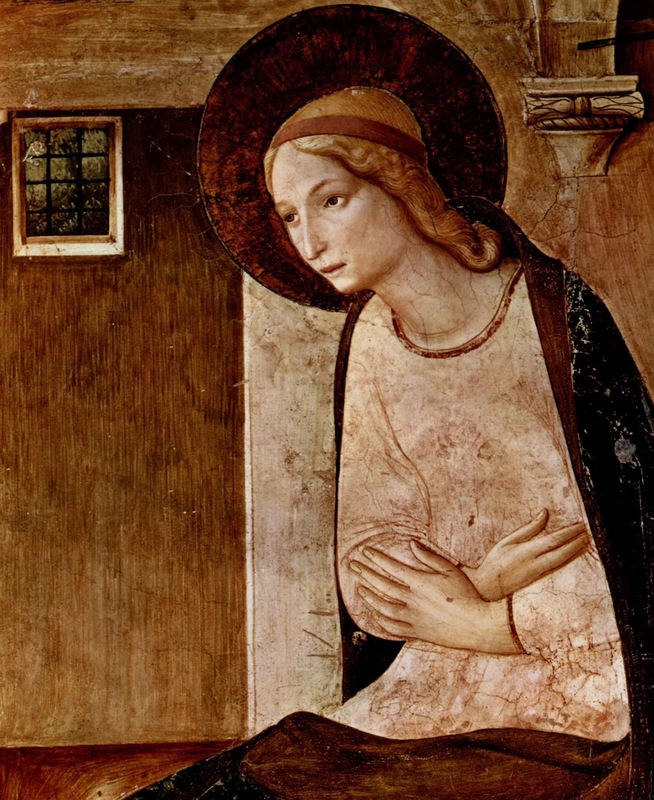 For a time, certainly, the Church consisted of her alone, she was the first to hear of Jesus, the first to have faith in Him, the first to give Him to the world, the first to follow Him. 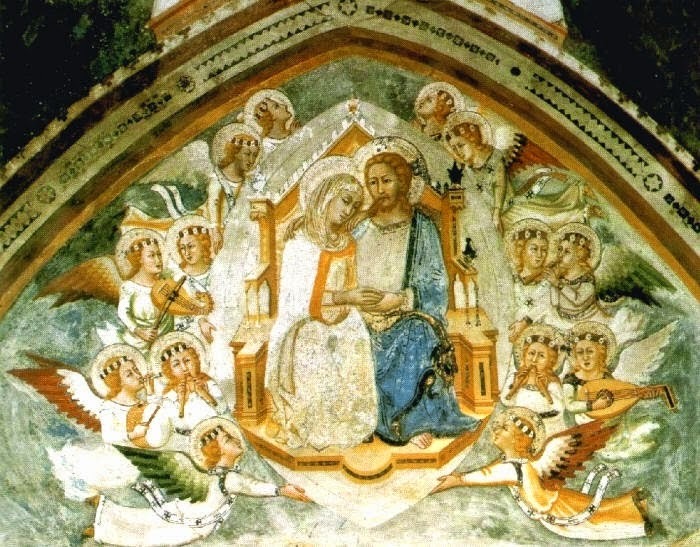 In part also it is because she most assuredly is the spouse of the Holy Spirit for by His power it was that she became fruitful and contained within her womb Him whom the heavens could not contain, the Logos of God, her Son Jesus. But I think even if we lay aside all these claims for Mary which Protestants for reasons of their own baulk at we should all be able to agree that our Lady represents to a superlative degree all those qualities which the psalmist outlines.